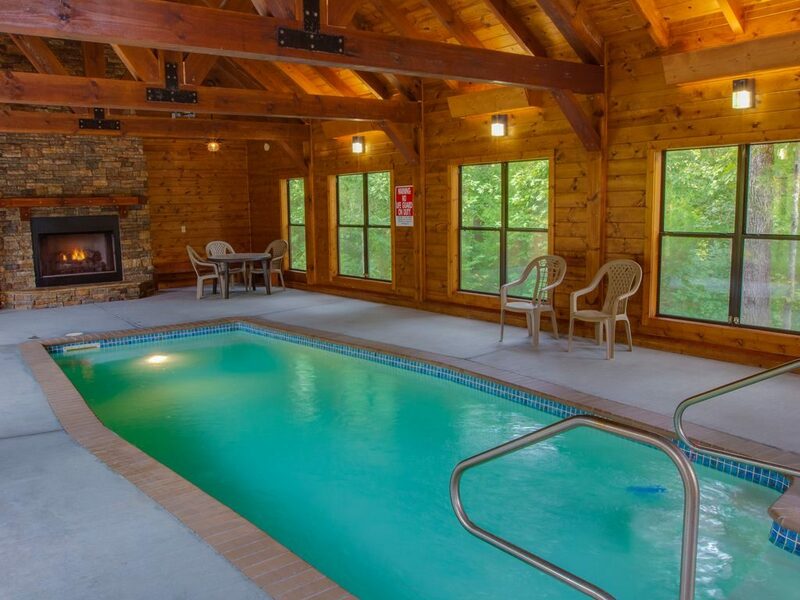 Tell everyone in your group to pack their bathing suit for the Moose Hollow Lodge! The lodge features a private indoor swimming pool! The heated indoor pool is situated 150 feet away from the main lodge and is kept at a pleasant 81 degrees throughout the year. This makes it an awesome place to hang out during chilly winter days or when rain may have spoiled your outdoor plans. The private indoor pool facility contains a beautiful fireplace that rises to the top of the building. It has a 50” hearth for the ultimate in comfort and luxury. If you step just outside of the pool area, you will find picnic tables and grills. Here, you can enjoy a fun barbeque while watching your family and friends swim in the pool! Enjoy the sight, sounds and comforts of a state-of-the-art movie theater on the first level of our large cabin in Pigeon Forge! This 22 seat theater brings the excitement of the multiplex to your cabin. Watch the latest DVD and Blu-Ray releases in high definition! Our theater is also the only rumble seat theater in Pigeon Forge. You will actually shake, vibrate and rumble to feel the action of the movies! The walls are equipped with special sound proofing material to enhance the viewing experience. The massive 13’ x 6’ screen makes it easy for everyone to view the action so there is not a bad seat in the house. 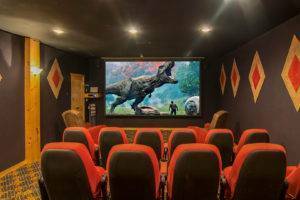 Prepare some popcorn and get ready to enjoy the home viewing movie experience of a lifetime! 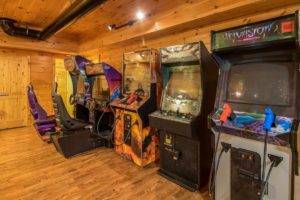 Another amenity that must be seen to be believed at the Moose Hollow Lodge is our huge game room with a variety of exciting arcade and table games! Challenge your family and friends to a game of billiards on the professional style pool table. Create your own tournament on the arcade size air hockey table. If you prefer arcade games, you will have a blast playing such popular games as Ms. Pac Man, Galaga, Cruis’n Exotica, Alien Invasion and more! There are also two pub tables in the game room so be sure to bring along some of your favorite board games from home. While playing in the game room, take advantage of the two televisions that feature Direct TV and hundreds of channels, including HBO and Showtime. 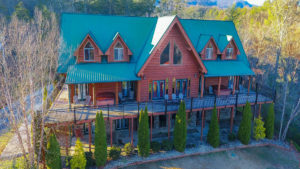 Reserve our large cabin in Pigeon Forge today! Pllan your group vacation to the Moose Hollow Lodge so that you can see our amazing amenities with your own eyes! We look forward to seeing you soon! The Moose Hollow Lodge is a sight to see. The Moose Hollow Lodge is a sight to see. You can’t really grasp the size of the 11,000 sqft space until you are there. We had a last minute change in wedding venue and the OWNER answered his CELL PHONE at 8pm on a Wednesday evening. We needed to have a wedding on a Sunday, 4 hours after someone else was checking out and his cabin management team Steve and Terri had everything done for us with time to spare. The communication skills on this team are superb and the cabin is like a fairy tale in the clouds. We used the conference center/chapel for our wedding and took beautiful photos on the grounds, in the cabin, and in the nearby surrounding areas. Check out T&T Photography for more and we will do everything we can to post to their facebook page. You are buying an experience that no other cabin on the mountain can offer you. With an indoor pool, chapel, 2 tiers of covered deck space and enough on site activities for the whole family, you cannot find a better all inclusive deal for a business retreat or secluded intimate mountain wedding. My wife and I will always come back to Moose Hollow Lodge and bring all of our friends and family. You know why? It sleeps 56 people comfortably and they wake up in a mountain filled canvas covered in a Tennessee sunrise. We couldn’t have asked for a better partner in making our weekend, our out of state travelers, and our most memorable moment of our lives a SCREAMING SUCCESS!! !